A 25-year-old man who murdered a prostitute before setting fire to her flat has been told he will serve at least 19 years behind bars. Steven Paul Smith, of Parkstone, Poole, Dorset, had been sentenced to life at Winchester Crown Court in January for the murder of Lomoki Mkwananzi. 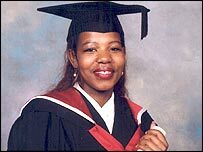 The body of Ms Mkwananzi, 29, was found at her home on Gordon Road, Boscombe, Bournemouth, on 29 March 2005. Smith had changed his plea to guilty during the trial. He was told on Wednesday that he would have to serve at least 19 years before being considered for release. During the trial, the court was told how Ms Mkwananzi - known as Millie - was working as a prostitute in Bournemouth, partly to fund a drug habit, and Smith had been one of her clients. The jury heard that, at first, Smith had denied being with Millie but then he later said that he had met her on the night that she died, but had left her fit and well. But the prosecution said his fingerprints had been found on an aerosol can that was allegedly used in the attack on Millie and that a pair of footprints in her blood found at the scene linked him to the murder. She had been hit, stabbed and strangled and was dead before the fire began in her basement flat.